Many WWII games just tell you what sort of equipment was used in a battle and off you go. However, Ostfront's Shipyard actually lets you construct different ships to take into combat. Using the special construction rules, you can create your own fleet from scratch and set sail for the high seas. You can get your copy now. 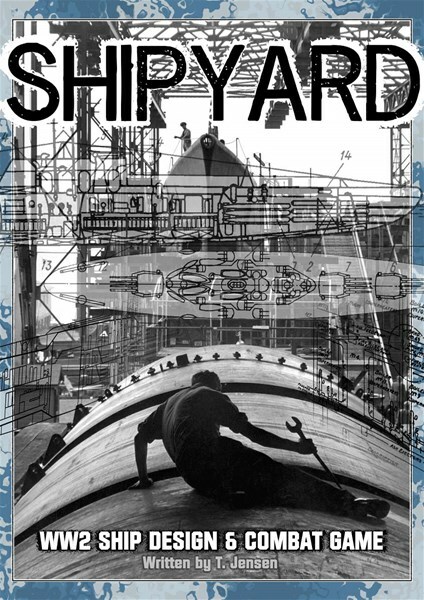 Ostfront Publishing is excited to announce the release of Shipyard - our WW2 ship design and naval combat game. Shipyard is a simple and effective ship design system is coupled with a more granular combat system, allowing you to quickly build a fleet before a game, then test them out in battle. Shipyard is designed for miniatures of around 1/3000 scale, although 1/1200 would work just as well. The game is designed for 2 or more players, on a table roughly 6' x 4' in size. An average game takes around 2 hours, including the time spent designing your ships (around 10 minutes to half an hour for designing, depending on the size of the game). Ship Building: Shipyard allows you to build ships of all sizes, from motor torpedo boats, up to aircraft carriers and super battleships. Each basic hull has a number of available "space" points, which can be spent on weapons, sensors, armor, or extras like aircraft, catapults and smoke generators. Combat: Shipyard has a unique combat system, aimed at simplicity and a dose of realism. Fog of war and communication is represented: Ships start the game inactive, steaming forwards until they detect the enemy. Once they become active, they can send messages and orders to other ships, and begin to move and attack as they wish. Rules for Gunnery, Torpedoes, Air attacks and defense, submarines, depth charges, evasive action and much more are provided, allowing for a fun yet fairly accurate rendition of WW2 naval combat.